Han Youngsoo, Hangang River, Seoul, Korea 1958, 2018, toned gelatin silver print, 16 x 20". Han Youngsoo began his career as a photographer after serving for three years at the front lines of the Korean War. “I left the army with these horrific memories intact and found myself in the middle of a life which still bore traces of soot from the war,” he remarked. Even more surprising, he found, was that “people lived on.” Han captured the humanity, delicacy, and humor of the perplexingly everyday moments that persisted despite the country’s devastation. In one of the many photos that he took at the Han River, a young girl bends over dramatically, her torso forming a line parallel to the ground so that the front hem of her dress touches the tops of her feet and the back hem rises up her legs. 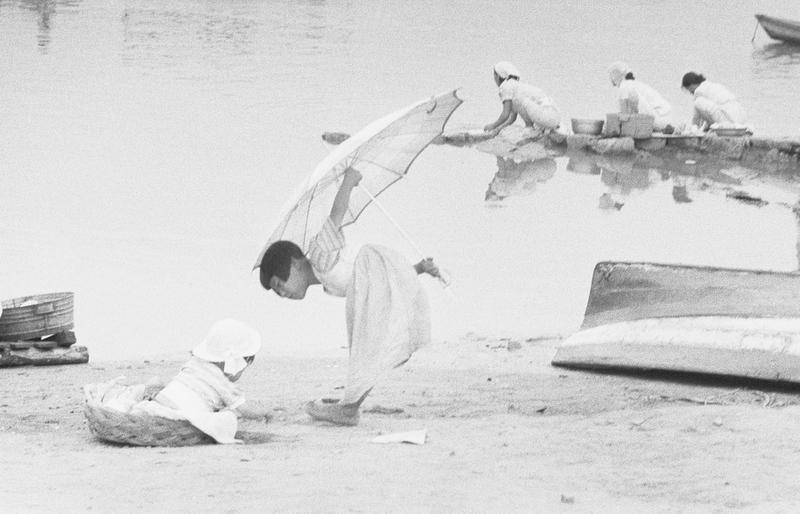 As she entertains a baby lying in a basket on the sand, she lifts an umbrella above her head; its curve points toward three squatting women who are washing their clothes in the water. The arches of their backs mimic that of the girl’s—even in these ordinary gestures of work and responsibility, Han found congruity. In addition to his pictures of the city’s perimeters, this exhibition showcases Han’s documentation of Seoul in the midst of its transformation. His street portraits depict businessmen and women alongside playful children, their figures often framed by the shadows of doorways or hidden by umbrellas, snow, or rain. The artist’s compositions suggest that he sought out moments of visual and social harmony, fragments of the quotidian that might exist only in the periphery of most people’s gazes.